Nokia is working on Android mid-range smartphone. 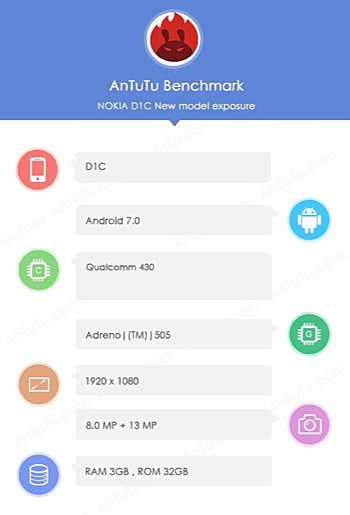 Now Nokia D1C smartphone information appears online at benchmarking services. The upcoming phone has been spotted on AnTuTu benchmarking. The benchmarking reveals that the device features Snapdragon 430 SoC, 3GB RAM, full HD display, a 13MP rear, 8MP front camera and has 32GB internal memory. The Upcoming Nokia phone will come with Google Android 7.0 Nougat.